About everyday, Mong Kok is full with shoppers, workers, employees, commuters, students and tourists. The streets are always crowded with people, buses and trucks. I love the place because it is so easy to just let yourself drift with the masses of people, waiting to be washed up in some new, exciting place. Today I am writing about the street food in one particular corner of Mong Kok. The area is about half a square kilometer large, making it very easy to wander around and explore in its fascinating detail. I will describe to you my favorite 7 places for take away food, but I do encourage you to keep an open eye and try out the plenty of other surprises that this area holds for you. To get there, take the MTR to Yau Ma Tei station, get out at exit A2 and walk north to Dundas Street. Once you take a right into Dundas, you will quickly notice the many small shops selling all forms of fats, sugars and carbohydrates. I prefer late afternoons and early evenings for this journey, though i prefer this time of the day for everything. We start at Tim Ho Wan, the famous Dim Sum Restaurant owned by Mak Pui Gor, who made himself a name as the dim sum master of the Four Season’s hotel. I know it’s not technically street food, but tonight we’re going there first to drop a small order of take-away that we will later consume in Sai Yee Street Garden. The line for take away is only a fraction of that for dine in, and 7 eleven has a much better drink selection anyway. From here we will go back to Dundas street to pick up an order of fries. What makes this place special is the endless varieties of sauces and powders. We go a little further along Dundas to the corner of Sai Yeung Choi Street. 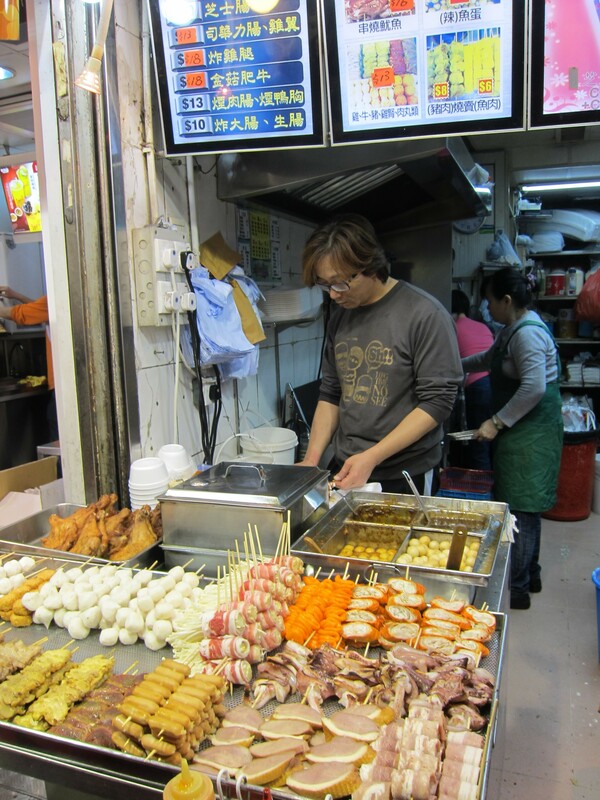 This is a typical Hong Kong style street food stall that fills your everyday cravings for lobster and fish balls, fried tofu and assorted vegetables. I love this place for its grilled octopus with spicy sauce. The fried squid is also wonderful, though it often is cold and a little too salty. English menu: No menu at all, point at things you think look good! Going north on Sai Yeung Choi Street, we turn right at Soy Street and follow it to the crossing with Fa Yuen Street. At this corner, on our right is Tokyo Station, a marvelous Japanese street food place with plenty of stuff for the grill. From here we go south along Fa Yuen Street. Just one block ahead is a Taiwanese place that sells fried and cooked dumplings. Unfortunately they have a minimum order of 5 for each sort of dumplings, so do bring friends so that you can eat yourself through the menu without filling yourself up! It’s probably time to pick up the Dim Sum from A) Tim Ho Wan. A great place to enjoy these and the dumplings from E) is the Sai Yee Street Garden. Even at times when Mong Kok is packed, this little park will be a nice refuge. There are two 7 elevens around and public restrooms. 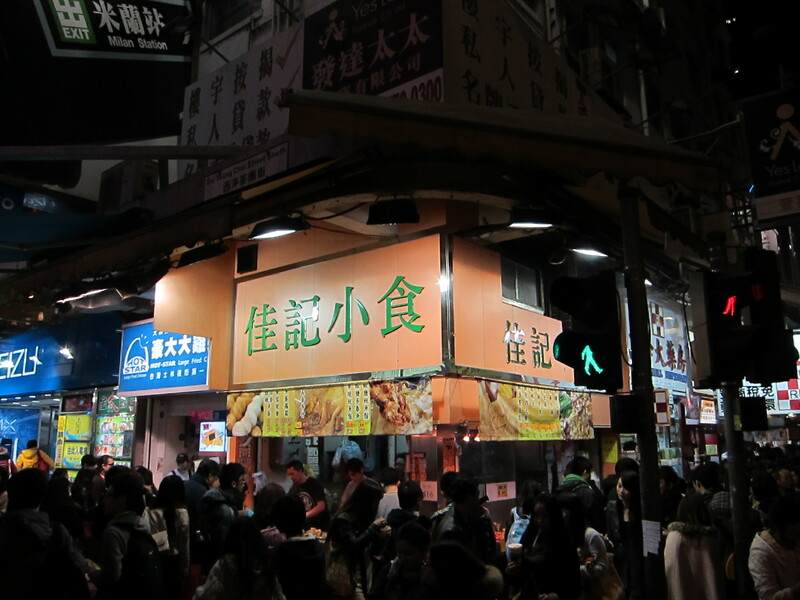 Just next to Sai Yee Street Garden is a Hui Lao Shan, the popular mango dessert chain. They are found all over Hong Kong, and this particular place is as good as the others, and also as pricy, at least compared with the other great food on our tour. I also really enjoy Ocio Waffle, though I have nothing in particular to say about it. I hope you enjoyed the food as much as I usually do! Again, if you have a favorite place in this area, leave a note in the comments! And if you still have a little energy and are not too full, check out the arcade above F) Hui Lao Shan! My favorite game is OutRun 2, one game is only 2$ and it’s great fun! Update Feb 15: English menu information added, thanks Sharad! This entry was posted in Food by Leonhard Weese. Bookmark the permalink. The info that you posted are very interesting (even myself as a HKer doesn’t know some of these spots), though I find ‘white words, black background’ layout hard to read at times. You may also want to add about Mr. Wong’s and do all these places have English menu? Thanks for the comment! I’ve added the information! But I do think Mr Wong deserves a special post, after all we spent a full night there!